So you are working on making your next project live. Well, creating the right prospect before the launch of a product is really very fateful for the success of the product. It doesn’t matter if it is a $10 E-book or a $100,000 E-commerce store, the right hype can make a difference in the result of your marketing campaign. Coming Soon and Maintenance Mode is a WordPress plugin that helps you in setting up the “Coming Soon” page with just a few clicks. It has a very simple and clean interface that makes this plugin a perfect choice for those who just don’t want to get into the technical stuff. If you are also struggling to find a perfect plugin to make your work easier, you should go for the Coming Soon WordPress plugin. Below I have mentioned some of the best features of Coming Soon and Maintenance Mode plugin. This plugin offers 70+ premium templates that are ready to use. All of these themes are designed by professionals. Every single template is fully customizable so that you can adjust them as per your need. 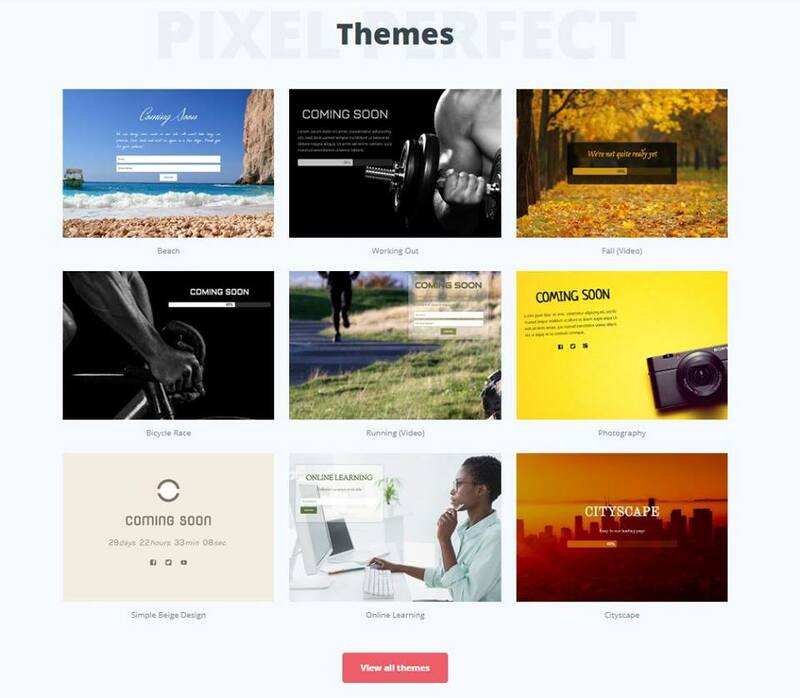 All you just have to visit the themes section and hover over the list of themes until you found the best match for you and activate them from the plugin directly. Having such a big library of themes and templates allows users to find the perfect branding ideas and design solutions and it becomes very easy to set up their page. You might also like to check Best premium WordPress theme that make your website a new brand. Coming Soon plugin offers you a massive library of 650,000+ free images for setting up your “Coming Soon” page. You can easily find the perfect image that suits your business with a few searches. Even if you don’t find any appropriate picture, you can upload your own easily. You can choose between a static image background and animated video background. This is one of the features that attracts me a lot. Being a web developer, I always had issues when my online clients want to see the progress and current condition of work. It was a very difficult task for me because I need to go over the TeamViewer and after that, they can see that. But with the help of this plugin, I can share the secret access link directly to the clients so once they use that link, they can see the real web page instead of that “Coming Soon” page. Even it also offers a feature of whitelisting. With the help of this feature, you can whitelist the IP of your client’s PC, so whenever they visit the site, they won’t get affected by the coming soon page and can access the real site. It also offers you to arrange the social media preview so that “Coming Soon” page won’t get cached by the social networks. All you need just to enable the Send no-cache headers option and that’s it. So whenever you launch your website, social media preview will also get refreshed and instead of showing Coming Soon page, they will see the real website. It is packed with some great SEO features. SEO snippet preview, SEO analysis, Social preview image are some of the important functions. Even you can also configure your site with google analytics with the help of this plugin. Once you configure your site with Google Analytics, you can directly get the traffic details from your dashboard. The interface of the plugin is very simple and straightforward. It just only has the feature that you are seeking for. Also, that drag and drop feature is very impressive. You can set up your page in just a few minutes with the help of that feature. Also, you can use animated videos too, and even those images and videos support’s the filters that are inspired by Instagram. These were some of the best features of Coming Soon WordPress plugin. Besides these features, they also offer some awesome features that help in Improving user’s experience and making things simpler and easier. Coming Soon plugin offers three different type of plans to choose from. The first one is the most affordable one which costs $29 per year, but this one is limited to one website only. The second one costs $79; this is a one-time payment plan, but still, this one is also limited to one website only. And the third and the best plan is Unlimited lifetime license; this plan is a one-time payment plan which offers you unlimited websites. They also offer 70+ templates in this plan which was missing in the previous two plans. For a depth comparison of their pricing, you can visit their pricing page. Coming soon is a great plugin for those who don’t wanna get into the technical stuff of coding and programming. Especially if you run a web development company or provide web and WP development services, this will be the best tool for you. They have a lot of features that can boost your business as well as save a lot of your time. But still, if you want this tool for the one website, I will suggest you go for any free plugin. But in the end, it’s on you. If you are okay with investing in this plugin, it would be a great investment.